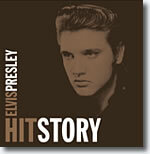 Released in October 2005 'Hitstory' is a 3 CD set described by BMG as - "With hits from all three decades in which Presley recorded, 'The Story Continues' is an essential collection. This three-disc collection is the perfect gift. It comes in a magnificent and elegant hard-bound package with iconic Elvis imagery and a collectable poster". There are several ways to examine and appraise this Greatest Hits Trilogy and at least 2 reviews are necessary. - "Elvis Hitstory is a value-for-money Hit"
New from BMG is ‘Hitstory’ a triple CD set featuring 91 of Elvis Presley’s biggest chart successes. While realising that many of you will already own the sensational ‘Elvis 30#1s’ compilation (which features as the first CD here & includes the mega-hit ‘A Little Less Conversation’) the other 2 CDs may be new to you. CD 2 ‘2nd To None’, the 2003 follow-up to ‘Elvis 30#1s’, packs another powerful punch with yet more Elvis #1s. From the marvellous ‘Blue Suede Shoes’ to ‘Little Sister’ & ‘Viva Las Vegas’ through to some of Elvis’ better 70’s hits like the beautiful ‘Always On My Mind’ and the rockin’ ‘Promised Land’. The third CD ‘The Story Continues’ features more Elvis magic, if a little less familiar. The fifties and seventies are well-represented with great songs such as ‘Mystery Train’, ‘(Let’s have a) Party’ along with ‘I Just Can’t Help Believin’ & ‘My Way’. There is also the Bonus Track of Elvis laughing his way through a weird-and-wonderful live version of ‘Are You Lonesome Tonight’. While we all know the mid-sixties as Elvis’ uncreative movie-period, surely better songs could have been chosen than the execrable ‘Kissin’ Cousins’? After all ‘Ask Me’ was a number One hit in Australia and isn’t amongst the 91 chosen songs! The fact that several major hits are missing from this 91-track selection just goes to show how massive & significant Elvis Presley really was. Coming in a foldout digi-pack I found the lack of Elvis photos and information a little disappointing as only a chart-list is included. However Elvis ‘Hitstory’ is great value for money (you can find this 3 CD set for less than $25 at your local supermarket) so do check it out – It could make someone a very nice Christmas present. - "Please, Tell Me Why?" With ‘Elvis 30#1s’ BMG, along with producer David Bendeth, resurrected Elvis’ greatest hits giving them the 21st century audio-polishing they truly deserved and blasting Elvis back into the LP charts. Unbelievably, while every family already owned exactly the same songs on previous RCA Hit compilations, it became Elvis’ biggest CD of all-time, selling over 12 million. The follow-up ‘2nd To None’ also boasted a great newly-polished sound and a good track selection. Although it wasn’t the multi-million selling success that BMG had hoped for, it still sold a lot more than Elvis’ last LP while he was still alive! Unfortunately the lack of ‘2nd To None’s success meant that any idea of another ‘E.Hits Vol.3’ was cancelled. What's more no real money could be spent recreating a new Hits compilation from the original Studio Master Tapes retrieved from the Indianapolis vaults. So audiophiles with their hopes whetted, "Don’t Believe The Hype". The ‘new’ minimalist design continues and at least the front cover does have a nicely subdued shot of Elvis on it (unlike the cup-handle of ‘2nd To None’). The rest of the triple digi-pack packaging however is zilch. Dramatic photos of Elvis under each CD tray would have helped. My copy boasts on a little sticker "PLUS AN EXCLUSIVE BONUS POSTER" which sadly turns out to be the brown (& bland) photo on the backside of the folded-up chart information inside! Yes, The Colonel is still alive & working at RCA! More sleeve notes & explanation would be nice with such an extensive set of songs. On the chart listings for instance there is absolutely no information as to why ‘Suspicion’ (noted as being recorded in 1962) is sandwiched between 1973’s ‘My Boy’ & 1977’s ‘My Way’. Similarly there is no explanation as to why the 1955 songs come after 1957’s big hit ‘Got A Lot O’ Livin’ To Do’. I’m sure fans would also be interested in the reason 1957’s ‘Tell Me Why’ sticks out like a sore-thumb being finally released in 1965. Maybe I’m sounding like a whinger here, as there are some great tracks on CD 3, but something doesn’t feel right. If this is a round-up of Elvis’ Top Thirty hits why is the great ‘What’d I Say’ missed out for the lower-charting show-tune ‘Frankie & Johnny’? Similarly the mid-sixties gets the woeful ‘Kissin’ Cousins’ over ‘Easy Question’ or ‘Love Letters’ (A TOP TEN, #6 in the UK!). On the Australian/European edition both the first 2 CDs are exactly as previously released. There is no fix up on the master versions of ‘Wonder Of You’, ‘Fool Such As I’ etc as reported for the US release. I’m intrigued by the news that the US version has been corrected since the 2005 CD remasterer, Vic Anesini, would have to be extremely careful to match the audio dynamics of these replaced songs with the remixed David Bendeth tracks ‘from the original tapes’. After all, ‘The Wonder Of You’ single could never come from a ‘Studio generation tape’ as it was overdubbed. For the general public the tracklist is an appealing mix of smaller hits along with some sensational Elvis milestones like ‘Such A Night’ & ‘I Just Can’t Help Believing’. Unfortunately the mid-sixties section comes across as incredibly weak and the missing chart hits, mentioned above, could certainly have strengthened Elvis’ 60’s legacy. On a positive note they have sensibly used Kevan Budd’s great work from ‘Elvis At Sun’ for the early SUN tracks. However even for non-audiophiles the sound quality varies all over the place from song to song. The sleeve distinctly credits Vic Anesini as the Masterer of this disc (along with Andreas Meyer) and I have raved about their work ('Close Up' etc) in the past. Perhaps BMG has printed the incorrect information as it does seem unbelievable that this talented team was involved but no one else is named. However, whoever did the audio work on this CD, here it is as sloppy as Elvis’ favourite dish, black-eyed peas! No attempt has been made to match the frequency response of the songs so that they at least sound similar. The effect is as if a few tracks have been grabbed off the "Double Features" compiles, the rest from the 50s, 60s, & 70s box-sets. You can make the sound of the tracks match better by simply using the treble & bass controls on your amplifier, so I’m sure even something as simple as an audio-equaliser in the mastering. This is where the hype about "remastered with DSD technology" is rubbish if you are still using the same old crappy tapes as the source. While I realise that audio-matching takes time and money (hence the first 2 CDs sounding so damn good) any sound engineer could have improved these versions by playing with an audio equaliser and with less than ½ an hour spent on each song! I can also see no reason why the same tracklisting couldn’t have been placed in true chronological order, which would also have improved the journey through Elvis’ chart-legacy. The good news - The Sun tracks have all been taken from Kevan Budd’s excellent mastering for the ‘Elvis At Sun’ CD. If you don’t own that CD then this rockin’ version of ‘Mystery Train’ alone will be worth the price of admission! However this does not apply to the other 1950s tracks where they have been lifted off ‘Elvis ‘56’ or the ‘50s box-set’. Unfortunately ‘Party’ and 'Got A Lot O’ Livin’ To Do’ still have that messy echo over the whole song as opposed to the great (Kevan Budd) versions on the recent BMG 2005 re-release of the ‘Loving You’ CD. This is where I start becoming annoyed as I realise that Elvis fans have already purchased better quality versions of these songs on previous BMG releases! Whoever supplied Vic Anesini with his working source tapes didn’t try very hard searching for the best quality versions! Whereas Elvis’ 1957 tracks on the first 2 CDs leap out at you compared to the previous incarnations (try the fabulous ‘All Shook Up’ on the first CD) here Elvis’ 1957 hits are the same quality as the 1992 ‘50s’ box-set’ versions. The disappointment continues with Elvis’ lame sixties movie songs. These are all taken from the "Double Features" tapes showing no new sparkle at all. If ‘Kissin’ Cousins’ had to be included a quick frequency tweak could have least given it some "audio balls"! ‘One Broken Heart For Sale’ is prime example of these lost opportunities. It is of course the echoey-compressed "Double-Features" mix as opposed to the new version on the FTD ‘It Happened At The World’s Fair’ which had a lovely new sparkle to it. It would have taken very little time to use the FTD version and by adding a little reverb and bass-boost created a great sounding and new version perfect for this CD. Elvis fans are certainly spoilt with the wonderful FTD CD series as they do demonstrate how good some songs can really sound if taken from the original Studio tapes. ‘Kiss Me Quick’ sounds excellent on the FTD "Studio B Nashville Outtakes" however here it is again the echoey compressed 60’s box set version. Similarly why not use 1966’s ‘All That I Am’ from the FTD ‘Spinout’ soundtrack CD where the distortion of the single had finally been fixed? The argument that "Original" versions had to be used doesn’t hold water, as the Double Features versions weren’t the original mixes either! ‘Suspicion’ sounds terrible here placed after ‘My Boy’ and yet it sounded so much better on ‘Such A Night – Essential Vol.6’ rather than this echoey ‘60’s box-set’ version. ‘US Male’ was also superior on ‘Today, Tomorrow & Forever’. The 1970’s tracks are all as from the ‘70s box-set’. There is the genuine excuse that so much of Elvis’ material in the 1970s was overdubbed so re-creating great new versions from Studio Masters becomes more problematic. However ‘Rags To Riches’ for instance sounds so much clearer and more dynamic on ‘Essential Elvis Vol.4’ and there are better versions of most of these songs already released. The ‘Promised Land’ 2000 CD upgrade also proved that the poor sound of Elvis 1970 LPs could be greatly improved upon. Interestingly ‘I Just Can’t Help Believin’ actually had a little too much hiss removed from it on the more recent ‘TTWII’ SE box-set and it is actually the better ‘70’s box-set’ version used here! So the track selection is the only reason to buy this CD since the new DSD Mastering offers nothing new. Even worse if you are a real Elvis fan you can compile a better sounding selection from what you already own! Note - Vic Anesini and Andreas Meyer both worked on the excelllent 'Elvis Ultimate Gospel’ which did state "Mastered from Original Master tapes" and there were genuine audio delights to be discovered since the improvements made on several tracks were outstanding. It sounded great. Verdict – If you are a hard-core fan you will already own all of these tracks and there is nothing here in improved audio quality. However the track selection is pretty interesting and anything that gives you another reason to hear Elvis’ fabulous ‘Mystery Train’, ‘Such A Night’ and ‘I Just Can’t Help Believin’ again has got to be ok. And let’s face it, Elvis ‘Hitstory’ is great value for money as you can find this 3 CD set for less than $25 at your local supermarket. If you don’t own ‘2nd To None’ I would thoroughly recommend it and why not give it to your Dad as it would be his perfect Christmas present? It wasn’t that long ago that I bought another historical Elvis 3CD set ‘Artist of The Century’. Capturing 3 decades of Elvis’ career it was nicely paced and featured some lovely liner notes and testimonials about Elvis’ cultural impact. Ignoring the amazing audio remixes of ‘Hitstory’ CD1 and CD2 it’s worth noting the differences between the track selection. Looking through these lists (where too many of my real favourites are still missing!) demonstrates how continuous RCA/BMG single CD releases of ‘Elvis Greatest Hits’ or ‘Top Ten Hits’ can never truly explain Elvis’ true musical impact. Review by Piers Beagley, EIN. November 2005.